32 slots along the edge for non-slip braiding. 6 inch diameter, 35mm hole. 3/8" dense foam. It is sturdy and holds the threads firmly. The experienced braider will enjoy using this plate to make samples and for portable projects, round braids and cords. Includes illustrated instructions and 3 project ideas. Fast 1st class mail shipping, via US Postal Service. We usually ship same day, 6 days a week! Kumihimo Double Density Disks are made of 3/4" (20mm) thick foam-double the thickness of our standard kumihimo disks! The additional tension created by the increased thickness is useful when braiding Tex 135 S-Lon, #12 Pearle silk, and 30G (or smaller) wire. Compatible with our Kumi Handle (KDHOLD). No-tangle thread bobbins with built-in weights! 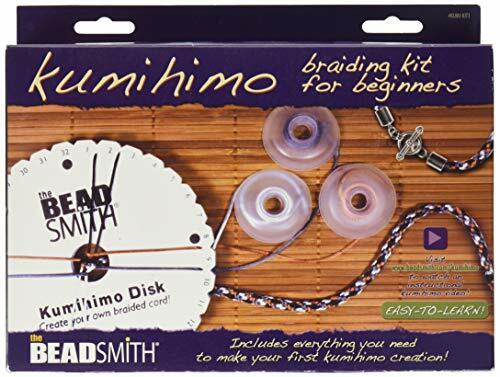 Ideal for kumihimo braiding with beads-weights maintain tension Keeps thin beading threads in place Patented, protective locking feature prevents thread from unraveling Stackable, pliable, and translucent Secure loose ends and prevent tangles Weights are easily removable! Kumihimo Double Density Disks are made of 3/4" (20mm) thick foam-double the thickness of our standard kumihimo disks! The additional tension created by the increased thickness is useful when braiding Tex 135 S-Lon, #12 Pearle silk, and 30G (or smaller) wire. Compatible with our Kumi Handle. 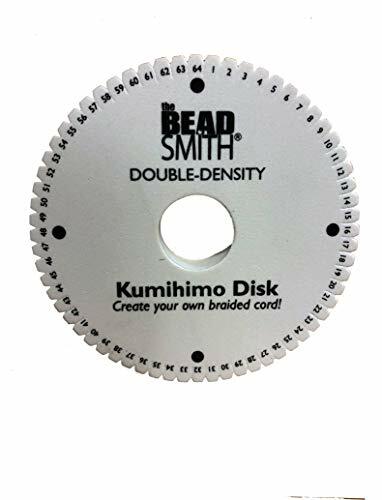 If you like using more than 16 threads when braiding, this disk is for you. It leaves you more slots between cords making it much easier to follow your pattern. 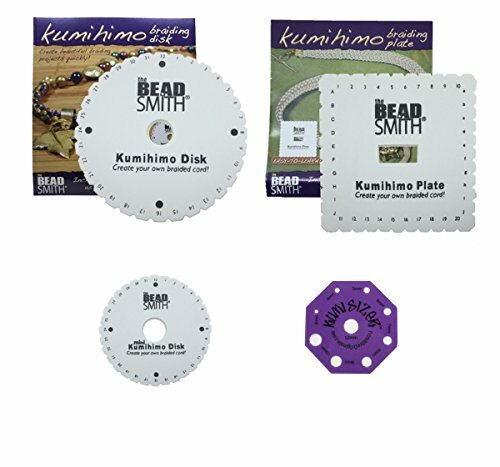 A set of three kumihimo braiding disks: the standard round disk; the square disk for weaving flat braids; the compact mini disk for small projects that you can easily carry around. The larger two include a page of instructions with suggested projects. Make round and flat braids, and small projects such as friendship bracelets with these. Also included: a complete kumihimo necklace kit, with 40 feet of 1mm satin beading cord. Cut into four 10 foot strands, then you double these over to make eight 5 foot strands, just right for one 20 inch necklace. Your first project! (Colors will vary) Note: This set does NOT include the Kumiloom disk (made for both round and flat braids). Two of these disks are for round only, the other for flat only. We ALSO include a twist/magnetic end cap to place on your finished necklace, a filigree bead focal point, and Primitive Originals' copyright instructions on attaching end caps. Kumihimo Basics and Beyond presents techniques for creating all-cord braids and beaded braids, then teaches beaders how to transform them into finished jewelry. Short demonstrations of the key techniques needed for each project are presented in easy-to-grasp portions, allowing beaders to learn and practice as they go. 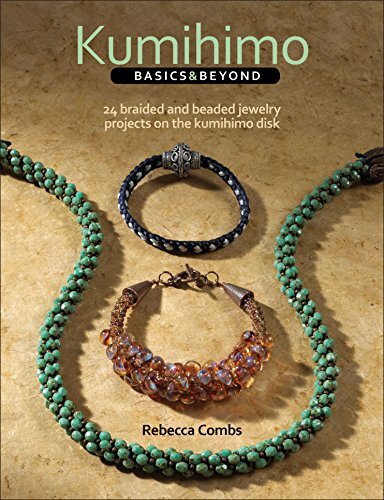 Rebecca Combs demystifies tricky kumihimo math” by providing detailed supply lists for each project in the book, plus teaches beaders how to calculate the amount of fiber and how many beads they’ll need for their future kumihimo projects. 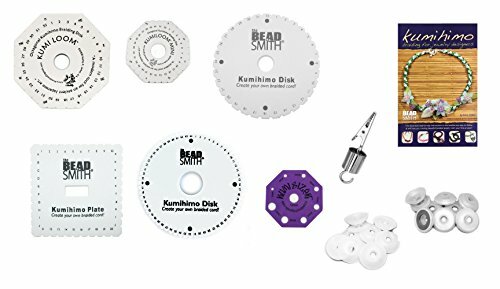 Beadsmith XTL-6103 No Tangle Flexible Plastic Thread Bobbins for Kumihimo or Macrame, White, 1-7/8-Inch, 8-Pack, White, 1.875"
These handy thread bobbins are great for Kumihimo or macrame enthusiasts. 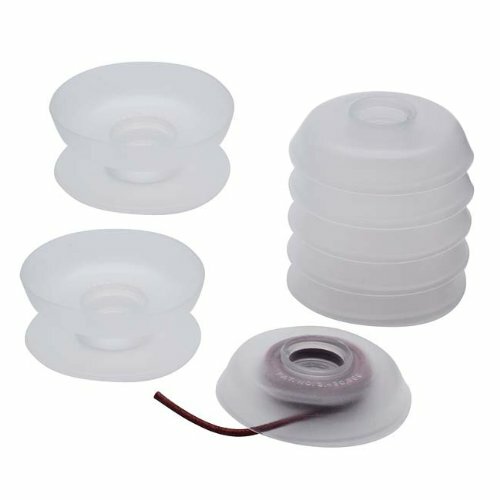 The flexible plastic allows you to flip open the bobbin and wind string or ribbon on to the spool. Flip the plastic back down over the thread after you have wound it around the bobbin. The patented protective locking feature prevents threads from unraveling and tangling. The bobbins are stackable and will snap together for easy storage. Measurements: 1 7/8 Inch Diameter. Quantity: 8 Bobbins. 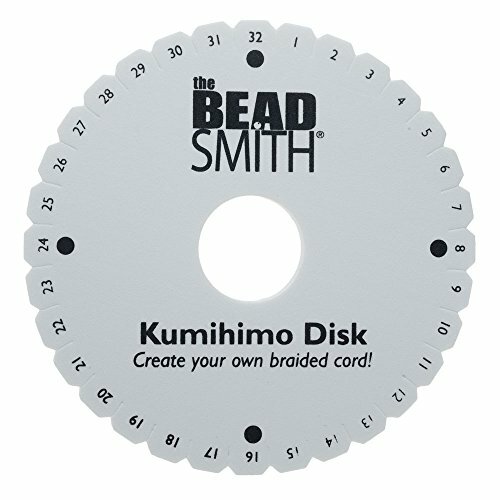 BEADSMITH-Kumihimo Disk: Square. Create beautiful beading projects quickly with this braiding plate! This package contains one 6 inch square sturdy foam plate with illustrated instructions and three project ideas. Imported. 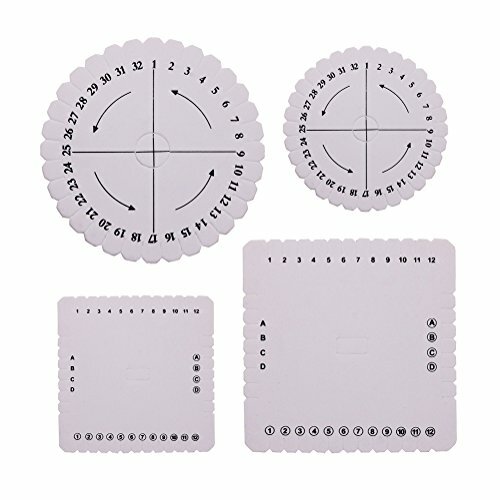 A set of three kumihimo braiding disks: the standard round disk; the square disk for weaving flat braids; the compact mini disk for small projects that you can easily carry around. The larger two include a page of instructions with suggested projects. 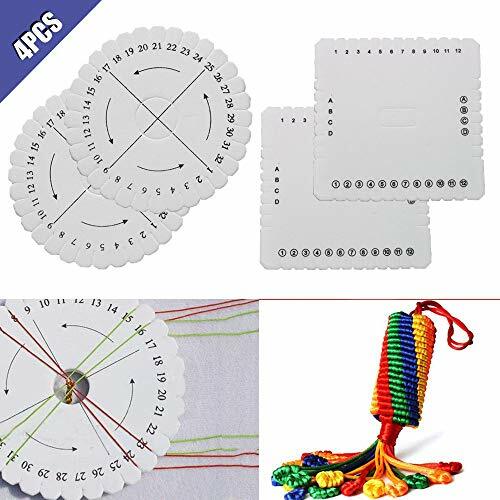 Make round and flat braids, and small projects such as friendship bracelets with these. Note: This set does NOT include the Kumiloom disk (made for both round and flat braids). Two of these disks are for round only, the other for flat only. We ALSO include a Kumisizer braid diameter measuring tool. 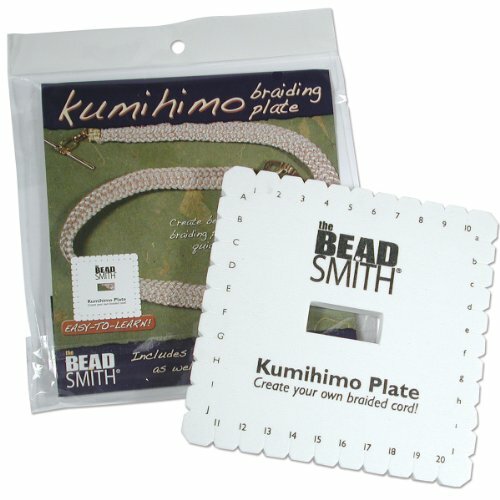 BEADSMITH-Kumihimo Starter Kit. Learn and create a beautiful braiding project! This package contains a braiding disk; Zap jewelry gel; eight Bob-Eez No-Tangle thread bobbins; one toggle clasp; two jump rings; two end clasps; one pendant slide; and a mix of colorful Kumihimo braid. Made in USA. Used in this video tutorial:. How to Use Kumihimo Weights. . Stop using makeshift weights for your Kumihimo braiding projects! 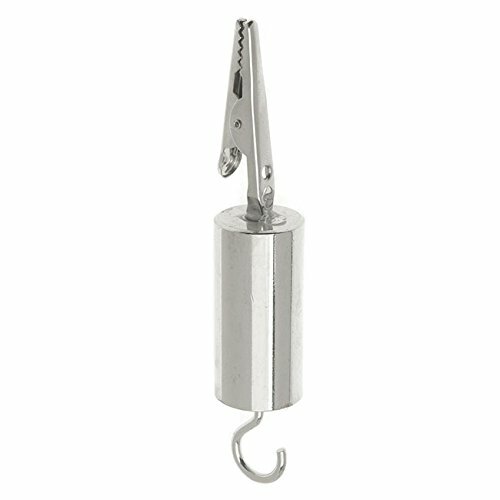 This handy gator-clip weight can be used for weighing your braid down as you work. Starting the braid will be easier and the thread tension will stay even while you work. Measurements: 3.2 Inches Long, 0.75 inches wide. 3.1 Ounces Quantity: One Kumi Weight. Discover the ancient art of braiding cords, otherwise known as Kumihimo in Japanese. The Kumihimo Mini Disk (KD602, KD603) is 4-¼" in diameter and made of 3/8" dense foam. The disk creates a rounded braid. 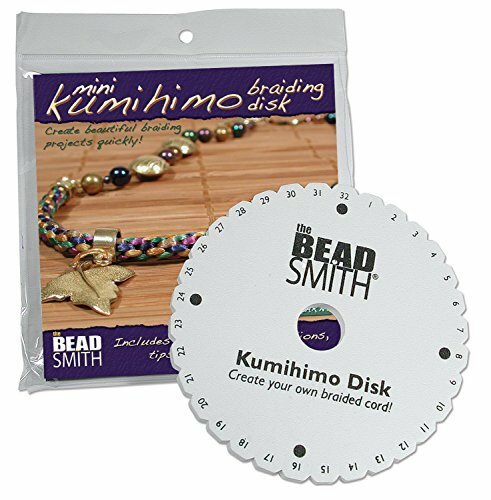 With the Kumihimo Mini Disk, you'll be able to create beautiful braiding projects quickly! The Mini Disk is sturdy and will hold the threads firmly as you braid. Because it is portable, you can easily take your projects almost anywhere. Compatible with our Kumi Handle (KDHOLD). A full assortment of looms and tools for the serious kumihimo hobbyist! The Kumiloom() is the only disk designed for BOTH round and flat braids; you get the standard 6" Kumiloom as well as the compact Kumiloom Mini! 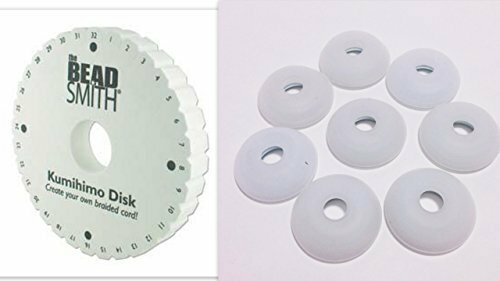 You also get three other 6 inch disks: one round (for round braids), one square (plate) (for wide flat braids), and one thick 64 slot for up to 40 strands (and since it is thick it can be used for extremely find threads). These three looms come packaged with instructions and project ideas. The Kumisizer() card, a valuable tool that allows you to measure the diameter of your finished cord so you can choose the proper end cap size. A professional weight with a gator clip for attaching to your cord. Eight standard 1 7/8 inch bobbins, and eight standard sized weighted bobbins. 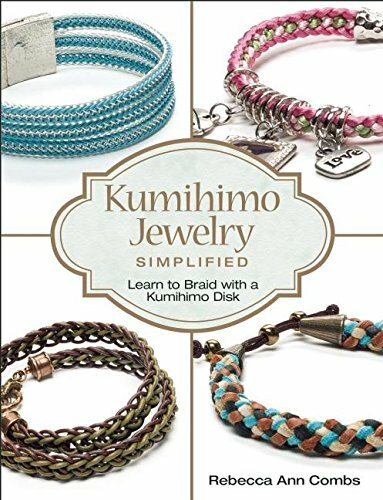 Finally, a full color 24 page pamphlet "Kumihimo Braiding for Jewelry Designers." with basic supply instructions, 8-warp instructions, how to finish braid ends, and lots of great project ideas (each with a list of materials and step-by-step instructions). 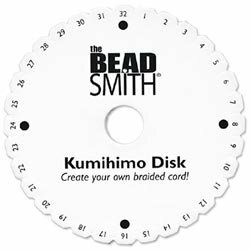 BEADSMITH-Kumihimo Disk: Round. 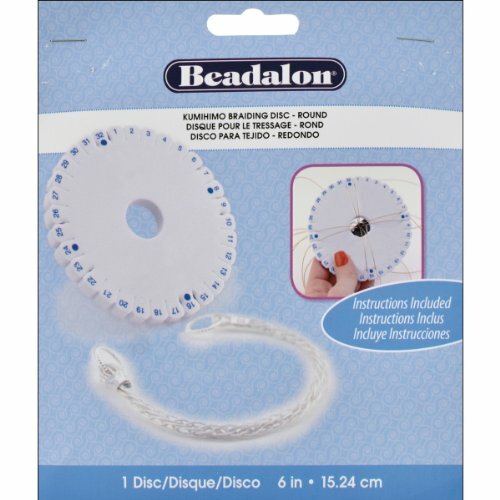 Create beautiful beading projects quickly with this braiding plate! This package contains one 6 inch round sturdy foam plate with illustrated instructions and three project ideas. Imported. Features: --This kumihimo plate is made of sturdy EVA which holds the threads firmly while you work. --Great for making flat braids and friendship bracelets, the large rectangular opening is ideal for adding beads or working with thicker cords. Specifications: Material: EVA Color: White Round Disc Size: Approx. 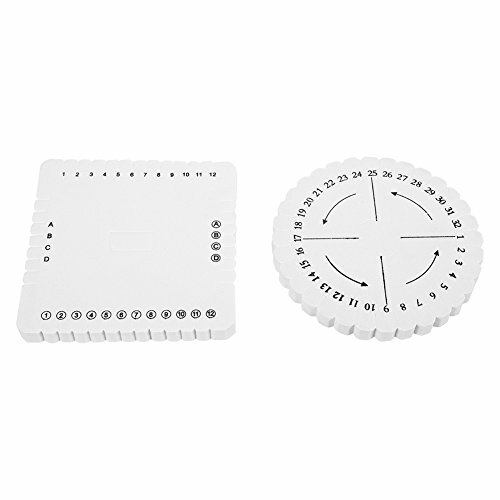 10 * 1cm / 3.9 * 0.4inch Square Plate Size: Approx. 10 * 10 * 0.9cm / 3.9 * 3.9 * 0.4inch Weight: Approx. 70g How to use: 1. Transfer bulk spools of beading wire, thread and cord onto user-friendly huggy spools that "hug" stringing material to keep from unraveling. Soft, see-through plastic allows for easy identification of color and type. Flat front is for labeling. 2. To open, bend curved side (back) away from flat side (front). Tape cord end or hold in place and wrap cord around spool to desired length. Bend curved side of spool back into place to secure cord end. Cord can be dispensed when spool is closed by gently tugging the end. Package Includes: 2 x Braiding Disks(Rope is not included) Note: 1. Please allow 1-2cm error due to manual measurement. Thanks for your understanding. 2. Monitors are not calibrated same, item color displayed in photos may be showing slightly different from the real object. Please take the real one as standard. 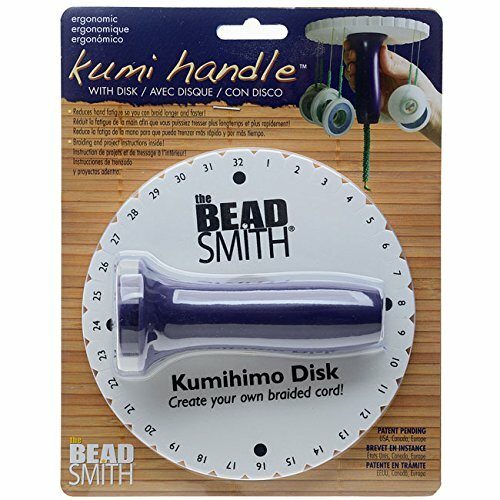 This innovative new kumihimo accessory helps to reduce hand fatigue so you can braid longer and faster! The hollow plastic Kumi HandleTM fits securely in the included round kumihimo disk and enables you to hold and rotate the disk with one hand while you move the threads with the other. The disk will hold threads firmly as you braid. Package includes braiding and project instructions inside. Handle is opaque purple. This is the second Kumihimo book by Rebecca Combs. This book will focus more on the beginner and shares some of the most popular features that made the first book a runaway success: conversational voice, skill-building format, Kumihimo math, and continuing to use the inexpensive Kumihimo foam disk. Kumihimo Simplified includes 5 new” braids: 8-warp basket weave, 16-warp rectangular, 16-warp hollow basket, 8-warp half-round, and 8-warp square. Beads will be included within the braids where appropriate, however, the focus will be straight braid. 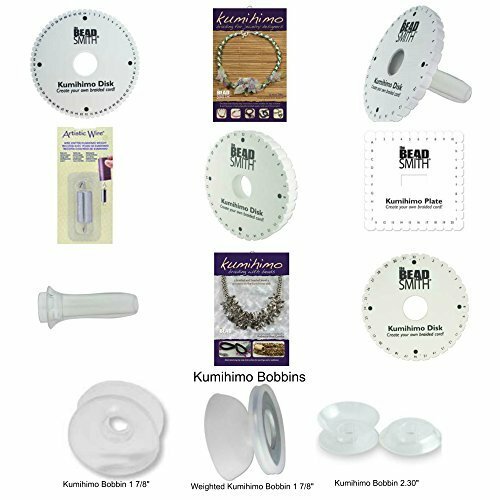 Special sidebars will include Creative Closures - 5 different ways to finish Kumihimo braids, besides the common gluing of endcaps. Here is a simple demonstration of Kumihimo Braiding. There are several samples of Kumihimo braid necklaces, with bead collage pendants, at the end. 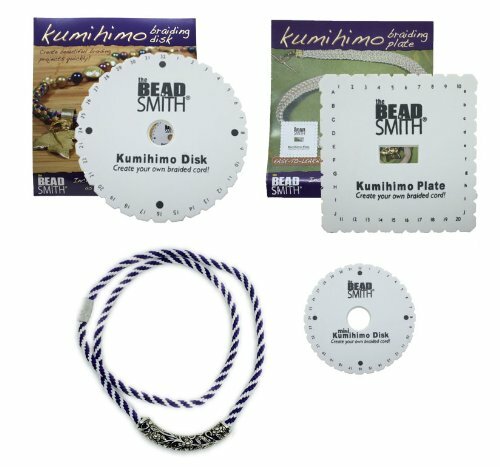 Compare prices on Kumihimo Disk at Elevelist.com – use promo codes and coupons for best offers and deals. We work hard to get you amazing deals and collect all avail hot offers online and represent it in one place for the customers. Now our visitors can leverage benefits of big brands and heavy discounts available for that day and for famous brands.